Acacia trees for sale online include varieties suited as flowering specimens as well as some that make good foliage or hedging plants. Acacia Trees are one of the most widely distributed native plants in Australia. Often referred to as ‘Wattle Trees’ they are a symbol of Australia and highly recognisable. Many species and cultivars available for sale have great ornamental qualities and are widely used in landscaping. Acacia or Wattles, are grown as ornamentals in many Australian Gardens, Acacia pycnantha commonly known the Golden Wattle is Australias National Floral Emblem. Although often thought of as has having yellow or golden flowers acacia flowers vary from cream through to gold the appropriately named Acacia purpureapetala has purple flowers and Acacia leprosa has red flowers. 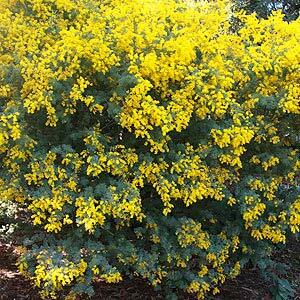 With a variety of forms from low growing ground covers to shade trees acacias are suitable for a range of landscape uses. Acacia iteaphylla even has a weeping form. Acacia melanoxylon or Blackwood is used as a timber tree. Acacia cognata ‘Limelight’ ‘Greenmist’ and Mop Top’ are low growing weeping forms of acacia cognata they grow from .5 to 1mtr high with a spread of up to 2m all with attractive foliage and all excellent in the rockery in a container or in the open.